The recent market selloff could not have arrived at a worse time for Twitter (NYSE:TWTR). Prior to the market’s retreat, Twitter stock had already dropped from $45 to $30 on fears of slow user growth, increased regulation, and intensified competition for digital advertising dollars. Then the selloff hit, making things worse for Twitter stock. It broke below $30 and now trades around $27.50. There is a strong, long-term bull thesis on Twitter stock at these levels. Assuming the company can maintain its share of the digital advertising market, continue to improve its monetization rates, continue to raise its margins, and stabilize its user base, TWTR stock looks like a steal under $30. But those are big assumptions. Recent reports suggest that perhaps those assumptions are too ambitious. Plus, tech stocks have not fared all that well lately. All in all, I think investors should wait for more clarity on Twitter stock before buying the shares. A good case can be made that Twitter stock will rise in the future. But that case needs to become clearer before the market will believe it. The bull thesis on Twitter stock is pretty simple. The bulls can point out that TWTR is a digital advertising company with a sizable, loyal user base north of 300 million. The company is improving its ability to monetize those users through ads. As long as the latter trend continues and Twitter maintains its digital ad market share, the company should be able to grow with the broader digital advertising market. The global digital advertising market is expected to grow around 13% per year over the next five years. Assuming TWTR maintains its share of the market, the company’s top line should increase by about 13% per year over the next five years. During that stretch, assuming that its average revenue per user, or ARPU, rates rise, Twitter’s gross margins should increase while its operating spending rate drops. Thus, its profitability should dramatically improve, moving closer to the levels of Alphabet (NASDAQ:GOOG,NASDAQ:GOOGL) and Facebook (NASDAQ:FB). If that happens, TWTR could easily earn about $2 per share in five years. Then give TWTR stock a forward multiple of 20, which is the average multiple for growth stocks. You get a four-year forward price target for Twitter stock of $40. Discount that back by 10% per year, and you arrive at a year-end 2018 price target of $30. Thus, at $27 Twitter stock looks attractive if you believe this company can generate earnings per share of $2 within the next five years. The problem with the aforementioned bull thesis is that it relies on too many assumptions. Namely, we are assuming that Twitter can stabilize its user base, continue to improve its ARPU rates, and maintain its advertising market share. None of these is a certainty. I believe that TWTR has a unique value proposition in the social media space, and that no one can convey real-time sentiment like it can. Thus, Twitter should be able to stabilize its user base. Also, this company’s ARPU rates are way behind those of its peers, and I have confidence that, given daily engagement growth, Twitter can substantially improve its depressed ARPU rates. But the biggest question is whether Twitter can maintain its share of the digital ad market. Amazon (NASDAQ:AMZN) is the new sheriff in the digital advertising town, and CNBC just reported that Amazon is stealing a whole bunch of ad dollars away from Google. That is bad news for Google. But it is also bad news for Twitter and TWTR stock. If Amazon is already stealing ad dollars from Google, the sector’s leader, then it is likely that Amazon is also stealing ad dollars from Twitter, which is a much smaller player in the digital ad market. If Amazon’s encroachment cuts into Twitter’s market share, TWTR won’t be able to grow its revenues 13% per year over the next five years. Instead, its revenue growth will be more like 10%, at best. In such a scenario, Twitter stock isn’t so attractive at $27. The broader markets are a mess right now. Tech stocks have been particularly weak because of rising interest rates. This doesn’t feel like the beginning of a bear market. Valuations aren’t that abnormal on a forward basis and relative to still-low bond yields. GDP is below trend and not booming as it does before bust periods. Net debt levels are at historically normal levels. Consequently, stocks will eventually stabilize. Until then, though, tech stocks will remain weak. Thus, before buying Twitter stock, investors should wait for confirmation that the broader market in general, and tech stocks in particular, have stabilized. Investors should wait for more clarity before they buy the dip in Twitter stock. If Twitter’s third-quarter results are as good as its second-quarter results and don’t show any sign that TWTR is losing ad share to AMZN, then TWTR stock is a buy with upside to $30 in the near-term. Until then, though, the best thing to do is wait on the sidelines. As of this writing, Luke Lango was long FB, GOOG, and AMZN. 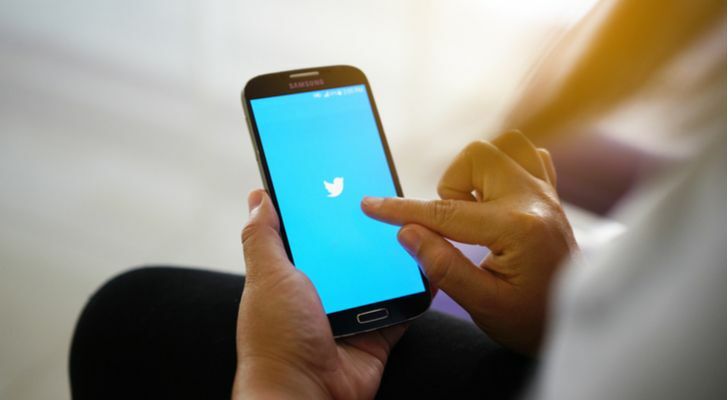 Article printed from InvestorPlace Media, https://investorplace.com/2018/10/dont-buy-twitter-stock-just-yet/.